"I sent the club a wire stating, "PLEASE ACCEPT MY RESIGNATION. I DON'T WANT TO BELONG TO ANY CLUB THAT WILL ACCEPT ME AS A MEMBER." "Those are my principles, and if you don't like them...well I have others." "One morning I shot an elephant in my pajamas. How he got in my pajamas I'll never know." "Well, art is art, isn't it? Still, on the other hand, water is water! And east is east and west is west and if you take cranberries and stew them like applesauce they taste much more like prunes than rhubarb does. Now, uh... now you tell me what you know." "Yesterday is dead, tomorrow hasn't arrived yet. I have just one day, and I'm going to be happy in it." "If you're not having fun, you're doing something wrong." "I have nothing but respect for you -- and not much of that." "He may look like an idiot and talk like an idiot but don't let that fool you. He really is an idiot." "If a black cat crosses your path, it signifies that the animal is going somewhere." "A child of five could understand this. Send someone to fetch a child of five." "Life is a whim of several billion cells to be you for a while"
"Just give me a comfortable couch, a dog, a good book, and a woman. Then if you can get the dog to go somewhere and read the book, I might have a little fun." "While money can't buy happiness, it certainly lets you choose your own form of misery." "Why, look at me. I've worked my way up from nothing to a state of extreme poverty." "If you've heard this story before, don't stop me, because I'd like to hear it again"
"The trouble with writing a book about yourself is that you can't fool around. If you write about someone else, you can stretch the truth from here to Finland. If you write about yourself the slightest deviation makes you realize instantly that there may be honor among thieves, but you are just a dirty liar." "Marriage is a wonderful institution...but who wants to live in an institution?" "Do you mind if I don't smoke?" "Groucho: You know I think you're the most beautiful woman in the world? 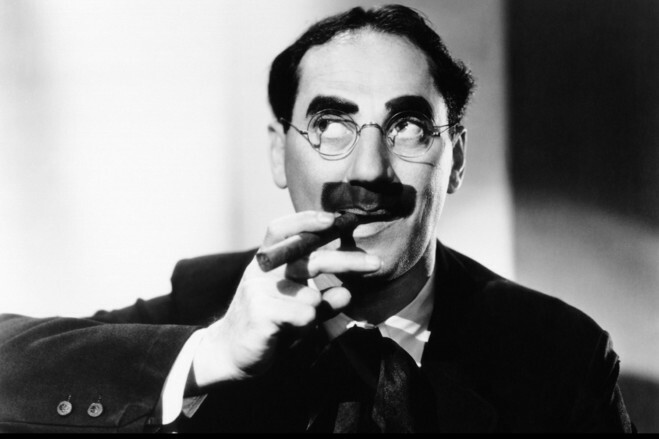 Groucho: No, but I don't mind lying if it gets me somewhere." "We'll meet at the theater tonight. I'll hold your seat 'til you get there. Once you get there; you're on your own." "I must admit, I was born at an early age. "